Good correctional practice includes applying principles of risk based classification to all adult and juvenile offenders while accounting for unique characteristics and concerns of LGBTI and gender non-conforming populations. To ensure a culture of safety, it is important to identify these individuals at intake. A culture of safety includes everyone understanding and practicing respectful, appropriate and professional language. Intake personnel function as the “gatekeepers” for correctional systems and facilities and are a critical component in the information gathering process. If information obtained at intake is inaccurate or misleading, it can have dire consequences and impact safety. Staff must have clear guidelines allowing for the consistent identification of LGBTI offenders and the collection of key information. Establishing good communication at intake is essential to obtain the necessary information for appropriate housing, medical and mental health referrals, programs, security level, and services in the community. During this broadcast we will demonstrate effective and professional communication with LGBTI offenders during intake and make recommendations to improve the intake process. 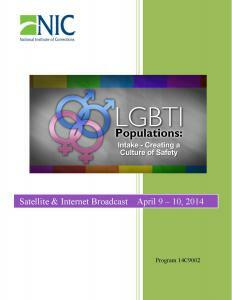 Using a variety of methods including on-air discussions and activities, demonstrations and skills practice, this two-day six-hour interactive training broadcast is designed to: establish the relevance of initial information-gathering and how it impacts LGBTI populations from intake to successful reentry; provide recommendations and good correctional practice examples to ensure a culture of respect and safety at intake for LGBTI populations and correctional staff; and provide practical examples and demonstrate professional communication with LGBTI populations at intake.